It was at the end of a long day in early summer, and we were immersing ourselves in the gentle delights of the Yare Valley, although not literally of course. We'd spent part of the day traipsing around the miserable suburbs of Great Yarmouth, and it was such a relief to be back in the rural heartland of the county. In fact, we were on the way back to Norwich so that I could get the train home, and from a map you might think Kirby Bedon to be outer Norwich suburbia. But nothing could be further from the truth. This is an intensely rural spot, deceptively remote, hidden in the marshes at a gentle curve in the River Yare. It was probably the river which was the cause of the haze begining to settle over the woods and meadows. A creamy light filled the graveyard, with all the intensity and shadows of the day's high sun now gone, the heaviness of early evening beginning to settle. Pevsner records that Diocesan architect Richard Phipson rebuilt the tower in 1884, and that the church itself is mostly of 1876, the year of the first restoration. 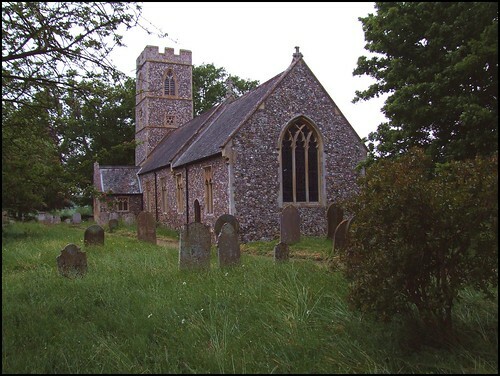 This makes it sound rather a dull place, but in fact there is rather more to it than meets the eye, and while the outer walls may well be Phipson's work, the overall feel is of a Norman church elaborated and extended in late medieval times, and then made good by the Victorians - a typical rural Norfolk parish church, in fact. Kirby Bedon has two fairly spectacular medieval survivals. One is a single pane of medieval glass in a south nave window. It depicts an angel, and I haven't been able to work out for certain what he is doing. But I think he is cutting a manuscript onto vellum, writing with a blade and then filling the cut with ink. Then, in the nave floor are two super shroud brasses, the corpses of William Dussyng and his wife wrapped up in their winding sheets, to remind us of where we are all going in the end. A well-to-do local family in the late 16th century were the Sheppards, and Richard and Anne Sheppard kneel in quiet content across a prayer desk, as if fully at ease with the Anglican settlement, with no reason to fear the puritan terror that the following century would bring. All in all, there is something peaceful and reflective about the interior of the church, and it seemed a suitable interior for the quiet village outside. I liked it a lot. We stepped outside into the cooling evening. The graveyard looks down onto the Yare marshes, and is home to a mausoleum with the proportions of a fabulously well-to-do garden shed. It is the last resting place of the troubled Sir Robert John Harvey. Harvey had been one of the two MPs for Thetford, but, when the constituency boundaries were reformed in the 1860s, he found himself kicked upstairs to a baronetcy. The family had made their fortune as bankers, and Harvey took over the running of the Crown Bank, presiding over its spectacular collapse in the late summer of 1870. Over-reacting slightly perhaps, he shot himself dead. By one of those ironies of history, his co-MP at Thetford had been Alexander Baring, whose own family bank would have an even more spectacular and newsworthy collapse more than a century later. Across the road, barely a hundred yards away, are the remains of Kirby Bedon's former other parish church, the round-towered St Mary, well-maintained, and well worth a look.